FILE - About 200 Catholics attend a prayer meeting for the Chinese Church after news emerge that Beijing and the Vatican have reached a deal on bishop appointments, in Hong Kong, China, Feb. 12, 2018. Members of Hong Kong’s Roman Catholic community are worried about a possible deal between the Catholic Church and China’s leaders. Many Catholics are unhappy with the church’s recent efforts to set up relations with the Chinese government at a time when it continues to silence critics. In the nearly 70 years since its establishment, the People's Republic of China has never had diplomatic ties with the Vatican. One reason is the Vatican's tradition of appointing bishops around the world. The mainland Chinese leadership considers this interference in the country. 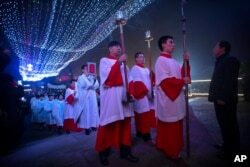 China's Catholics have been permitted to attend religious services under a government-supervised organization called the Patriotic Catholic Association. As part of its duties, the government officially names church leaders, some of which have been quietly approved by the Vatican. The Vatican leadership considers religious services administered in the patriotic church unacceptable. But the government's tight control of the group has led many observant Catholics to go elsewhere. Some have turned to an "underground" Catholic church. The Chinese government says the underground church is illegal. Its members have been arrested and treated unfairly. However, the members see themselves as true followers of the church. Critics say an agreement between the Vatican and the Chinese government would enable the Vatican to operate more openly in China. But they fear it would give China greater control over the church's decisions. Cardinal Joseph Zen is the retired bishop of Hong Kong. In recent weeks, he has criticized any deal that would permit Chinese control over the church as "evil." Retired archbishop of Hong Kong Cardinal Joseph Zen gestures during an interview in Hong Kong, Friday, Feb. 9, 2018. News reports have said the agreement would legalize the government-appointed bishops and force those in the underground church to retire. The reports say Pope Francis would have the final word on the approval of bishops. Zen has voiced concern that the Chinese government would only name bishops loyal to the communist leadership. "It's something important for the whole church, this attitude of fidelity and disrespect [of] our faith. … It's a very serious matter to disregard centuries of doctrine," Zen said. "They want everybody to come into the open and obey the government. They never say how they would deal with bishops in the underground. It's obvious what they are going to do… They will not only eliminate bishops, but in some dioceses have no bishop, but some kind of [government] delegate." Vatican officials have asked Catholics for time to work out details on the agreement. In Hong Kong, several Catholics have also said the move comes at a time when the Chinese government has grown more forceful under the leadership of President Xi Jinping. On Sunday, China's ruling party announced it would end presidential term limits. Under the proposal, Xi could serve the rest of his life as president. 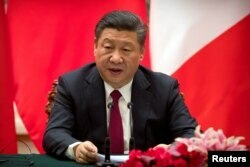 During his first five years in office, Xi's policies have attacked economic corruption as well as the work of human rights lawyers, labor organizers and investigative reporters. Chinese President Xi Jinping speaks during a joint press briefing at the Great Hall of the People in Beijing, China, Jan. 9, 2018. In December, the Vatican asked two bishops in the underground church in China to give their duties to men approved by the government. In the past, the Vatican had said that both men had been appointed illegally by the government. Government critics see this as an unusual interference, even violation, of the church's power. They are also concerned about signs that the government has restricted religious customs, such as orders that followers not bring children to worship. News of the Vatican's negotiations led several professors to launch a petition against any agreement that would give control of the church to the Chinese government. More than 2,000 people have signed the document. "We think the Catholic Church has appeal (for) the Chinese people exactly because it has refused to compromise with the Chinese authority," said Joseph Cheng Yu-shek, one of the organizers of the petition. He added that "…If the Vatican makes a compromise with Beijing, the Catholic Church loses that moral and spiritual appeal. And it doesn't benefit the church." Suzanne Sataline reported this story for VOAnew.com. Phil Dierking adapted her report for VOA Learning English. George Grow as the editor. Do you think It’s okay to let the Chinese government have more control of the church in China, in exchange for more open religious practice? We want to hear from you. Write to us in the Comments Section or on our Facebook page.